Mysore is a city of tradition. With its old world charm, monuments, forts and temples, the city offers an authentic royal Indian experience to its tourists. The city becomes the most opulent during the annual Dasara Celebrations. The festivities centering on Dasara honour Goddess Chamundeswari who slew Mahishasur, the bull headed demon. The city of Mysore is named on the slain demon. 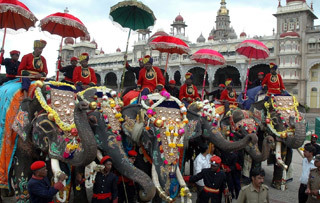 Vijayadasami or Dassara celebrations see the splendour of Mysore in the most magnificent way. For two days, the whole city comes together to celebrate this iconic festival and the Maharaja’s Palace is illuminated with lights. The temple parades and processions are also a highlight of this festival. 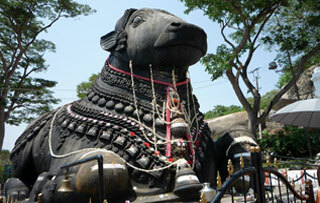 Upon arrival in Bengaluru, meet Incredible India Tour representative and proceed to Mysore. Famed for its magnificent palaces and rich culture, the city of Mysore is richly grand in every way. Known for its magnificent palaces, beautiful gardens, boulevards, shimmering silks and sandalwood, the palace city always is visited by tourists keen on experiencing enriched travel moments. Enroute visit Srirangapatna, the island fortress of Tipu Sultan and explore here his Summer Palace, Mosque and Sriranganatha Temple. Upon reaching Mysore, check into a hotel and evening visit Chamundi Hill where the motive of Mysore Dasara festival can be seen in the form of the gigantic Mahishasura statue, the bull headed demon who was slewed by Goddess Chamundi. After sightseeing, return back to hotel for overnight stay. Morning breakfast and proceed for full day sight seeing, visit Maharaja Palace / Amba Palace. A splendid example of Indo-Saracenic Style, the palace has many attractions, including the magnificent gold throne that is displayed during Dasara Celebrations. Also visit the Art Gallery in the Jaganmohan Palace and observe an excellent collection of ceramics, ivory, sandalwood, stone, antique furniture and ancient musical instruments. Next in the sightseeing is St. Philomena’s Church, an imposing Gothic church renowned for its beautiful stained glass windows work and lofty towers. In the evening, attend the rehearsal of Torch Light Parade at Bannimantap. Overnight stay. Morning breakfast, checkout of the hotel and proceed to Bengaluru / Bangalore. On arrival, check in to hotel, lunch and relax. Later on half day sightseeing and visit to lush Lalbagh gardens based on an area of 240 acres. Next visit the Vidhana Soudha - this massive building houses the state legislature and the Secretariat and return back to the hotel and overnight. Morning breakfast and proceed for full day sight seeing and visit Cubbon Park, Nandi Bull Temple enshrining the huge monolithic Bull, Nandi, the devout vehicle of Lord Shiva. Next visit the Museum famous as one of the oldest museums in the country. In the evening, visit Indira Gandhi Musical Fountain as a last sightseeing attraction of Mysore Dasara Tour. Later on return back to hotel and overnight.